Banff is one of those places in the world that is unbelieveable, like you honestly cannot believe that such a place exists on this earth. Upon driving into the Rocky Mountain Range, the horizon opens up into the mountains and it makes for a breathtaking site. The canyon that leads up to Banff National Park provides a stark contrast to the blue and green that greets you in the park. We also had a mountain goat welcome us as we arrrived. While we were staying in Banff National Park, the town that we were staying in was called Canmore, which we thought of as Banff's younger hot cousin. Canmore is really cute and cool. There was one part of the town where we drove across a stream that had this incredible view of the mountains. Everywhere you look there are just wondrously huge mountains at every turn. While in Banff we drove to all of the locations. As a person that does not particularly like driving, it was lovely to be able to see such beauty at every turn. I did not even mind all of the driving. We covered a lot of ground in only two days, and we were able to see essentially all of the sites that we wanted to see while also adding a couple that were unplanned. 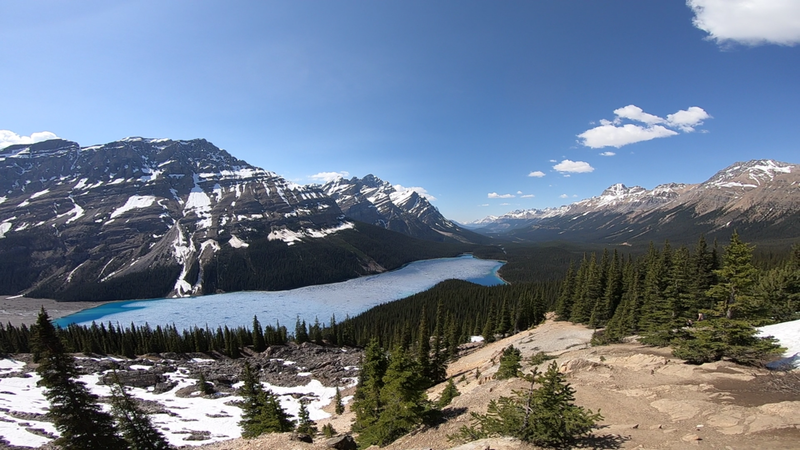 This is one of the most prominent viewpoints in Banff for good reason. The turquoise waters that break into the majestic mountains are beautiful even on a bad day, and we were lucky enough to catch it while the sun was shining. While you can easily walk to Lake Louise itself, we decided to hike a little higher into the mountains to check out Mirror Lake. Along the way we were able to see some really cool views of the lake from above. There is also supposedly a tea house that is up a bit higher, however it was closed when we visited. This will forever be know as Malone (like post Malone) Lake, since Laura could not stop calling it that. This lake takes a close second in my favorites on this trip. I just loved the way that the mountains echoed each other in what looked like a never-ending pattern. At this time of year with the snow-capped tips, the mountains looked like nothing else I have seen. Peyto Lake was my favorite of all the ones that we had seen. Standing on the edge of the cliff looking out at the way that the lake snaked into the depths of the mountain range was just stunning. The way that the mountains parted and the low angle that they took was such a cool site to see. Not to mention the way that the trees provided the perfect green frame for this scenic picture. Like I said, this was my favorite. On the second day, we went spent the morning in Canmore eating bagels, sipping iced coffees and walking around the market. After a little bit of a late start, we set out to explore later that day. This is an area that we explored at the suggestion of some nice Canadian ladies that we met at the timeshare. It was one of those moments that is part of what I love about traveling, the random interactions with different people that can inform future adventures. The exciting part about this canyon was that it had a little bit of everything. At the start, the trail walks through this tan and brown crevasse that follows a gushing river. While it was entirely safe, it also gives you the thrill of being near nature at its most ferocious. As we followed the canyon, there were three different waterfalls at different lookouts, each successively larger than than the last. The waterfalls were really beautiful, and beyond those waterfalls there were even more sites. We hiked up even further into the mountains to the ink pots. These were not so much ink pots as a collection of beautiful clear blue little ponds with majestic mountain backdrops. Johnston Canyon was incredible because there were so many elements of nature all in one place. While our trip was not very long, I had a wonderful time catching up with friends and experiencing a beautiful place that really was not to far from where I live. It is always good to remember that it is possible to have fun adventures that are close to you, and it does not have to be very expensive either. On this trip we ate out twice and bought groceries and made food for the rest of the trip. It makes for even more fun when you still have money left for your next adventure. Have you guys ever been to Banff? I hope to go back one day in the winter to go skiing, thanks for following along while I pursue my Personal Legend.